For more than 20 years, our consultants have garnered their combined wisdom and shared values to deliver sustainable asset and organizational integrity management programs to industries with asset-intensive processes. From the development of the first resource document - known today as API 580 - through the development and delivery of hundreds of RBI software and projects, we have continually refined our servant leadership to meet the needs of hundreds of clients. Today, our learning management approach and our skills assessment tools bring harmony, integrity, and sustainability to human performance improvement, work processes, and technology. We are committed to supporting operating companies around the world as they strive to obtain business advantage by improving their safety, integrity, and reliability of their assets. To support these goals, we will use practical risk based solutions to develop or improve our customers' people, processes and technologies resulting in quick, measurable and sustainable value. The consultants at Asset Optimization Consultants are relentless advocates for your best asset integrity program. Our commitment to client empowerment drives us to deliver the safest, most cost-efficient, sustainable programs. We combine the global collaboration of people, a learning management approach to processes, and the development of technology for measurable, sustained success of your asset integrity program. Collaborative relationships in a global environment are key to our successful approach. We combine the strengths of our consultants, your personnel, and a network of partners to achieve sustainable Asset Integrity Management programs. We deliver more than Asset Integrity projects. Our consistently successful learning management approach combines a reliable work process with flexible methods of delivery for the confidence and sustainability of your people. We use best-in-class technologies in master data management and data conversion to ensure the trustworthiness of your data. With a systems-level view of reliability across all asset families, your owner operator has the confidence to make critical decisions. As servant leaders, our highest priority is to encourage, support and enable those around us to unfold their full potential and abilities. 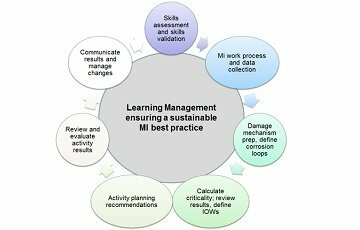 AOC developed Learning Management as an approach to deliver the greatest possible sustainable performance for delivering and managing asset integrity management programs. Learning Management aligns work process best practices, with the people delivering and maintaining the program as well as the technology utilized to facilitate and measure the performance of the program. Through mentoring, on the job training and ongoing skills assessment, we have been able to affect human performance improvement that transforms the owner's personnel to an enhanced safety and performance culture, crucial to becoming an effective, compliant and reliable operation. Whether closing the gaps on a mechanical integrity assessment or delivering a world class RBI program, the owner's personnel are enabled to embrace the new processes and procedures and develop the discipline and effective behaviors to utilize them in all circumstances. We firmly believe in seven core values that protect all people, drive our solutions, and contribute to the success of our clients. Our rich heritage began with the initial collaboration of two founders. More than 20 years later, our company is built on our shared wisdom and experiences. Meet our trusted team members and consultants, including an executive team with more than 400 years of combined experience in providing risk-based solutions. Join a network of partners who match our standards of excellence in delivering asset integrity management best practices for owner operators. Our servant leaders and longtime partners share an easy rapport, collaborative power, expert knowledge, and critical resources. These multidiscipline teams ensure high quality, dramatic cost-effectiveness, and precision of work process best practices inherent in our Learning Management Approach. Because we are focused on asset integrity management, AOC and our partners align ourselves with the work processes required to achieve world class asset integrity management. Therefore our partners go through the same rigorous training that our own consultants and owners go through; a prerequisite for entering into and sustaining the partnership. Our employees are our most important asset and our promise to them is to provide the highest degree of technology, support and personal integrity in all that we do. It is an exciting time to join our team. As we continue to grow, our work using best in class technology and tools, take us around the globe on many exciting and challenging projects. We work in virtually all parts of the energy sector; including upstream, downstream, midstream, chemicals, petrochemicals, and mining. If you are interested in a rewarding career where you really make a difference, we welcome the opportunity to visit with you.